In developing the reconfigurable rig and tilt mechanism, a few instances have arisen where friction joints are being used to support the structure of the rig. One possible solution to this issue is to place stoppers at the ends of the dowels to eliminate the possibility of them coming loose. 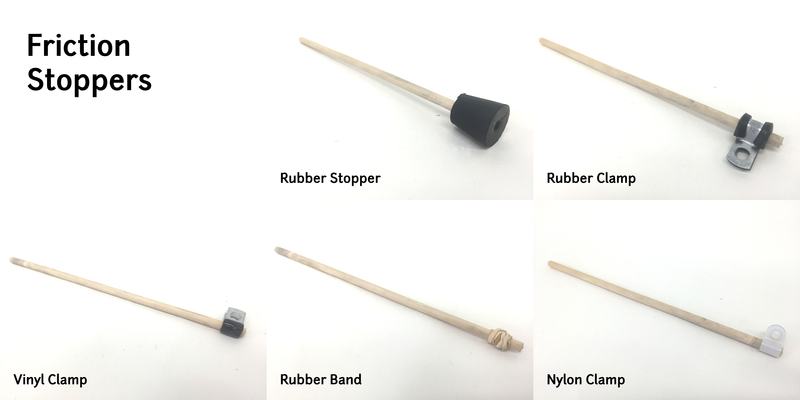 Rubber Stopper - This stopper requires no hardware and has a strong enough grip that the dowel can't be pulled out without a very large amount of force. However, it is very large relative to other options and is also the heaviest. Rubber Clamp - This stopper gives a strong clamping force on the dowel if it is a size or two smaller than the dowel diameter (1/8" clamp to 1/4" dowel as shown). However, it does require hardware, and is relatively heavy. Vinyl Clamp - Much like the rubber clamp although slimmer and cheaper, it gives a sufficient clamp force and does require hardware. Rubber Band - The looped rubber band is the cheapest and lightest option, and also gives a grip force very similar to the rubber stopper. Nylon Clamp - While lighter and cheaper than its metal counterparts, the nylon clamp provides less grip force and requires hardware. Which of these options would you prefer? Are there any other methods you have seen or used that might be more effective than these? With some rig/camera combinations and with certain wind conditions any of these techniques could work. I might use any of them if I assembled the rig myself and inspected it before the flight. For a commercial product which could be used by anyone with various cameras in lots of different wind conditions, an eventual failure is likely. I would not recommend using wooden dowels for any load bearing component of an aerial camera rig. Fiberglas and carbon fiber rods and tubes do not add that much to the material costs and provide a substantially greater strength per weight ratio. The stronger material allows much simpler locking solutions like a single small pin through the shaft. A pin is much easier for an inexperienced user to assemble correctly so the chance of failure decreases. People who are flying $100 cameras are probably willing to pay more than $15 for a smart, safe, and easy to use system for attaching the camera to the flying line. Thanks for the input Chris! The reason I have been using wooden dowels is for their wide availability (can be consistently found at any craft, hardware, or home improvement store). I agree that a pin through the shaft provides a simple and reliable locking solution, although my goal is to find a solution that can be incorporated without the use of tools. Wooden dowels are widely available, but they also vary widely in quality. Oak and sometimes maple dowels are fairly reliable and birch, poplar, and other woods are less so. Many hardware store dowels are imported, so the wood used is sometimes unknown. Some dowels are quite unsuitable for building camera rigs. The no-tool rule is a nice goal, but most of your solutions require a screwdriver and pliers, maybe even in the field. Cutting the tubing and dowels requires a tool. A pin requires a drill to make the hole, but requires no tool in the field. So I'm not sure what the ultimate goal of the no-tool rule is. This is a DIY community, so tools are a big part of it. another thought is using a rubber band wrapped around the dowel, then clamped with a small zip tie. The combination of pressure from the tie on the friction from the rubber is really strong. Just this image, but without the threaded rod. The other option was the zip tie only method from all my little pendulum rig notes. You snug up a zip tie as tight as you can, then slide if off the end of the dowel. Now tighten it one or two additional clicks, then force it back onto the dowel. This is a strong friction stopper in itself. Of these options, the rubber band holds the firmest-- simplest and cheapest, though rather ugly looking. @cfastie's points about pins are good ones, and I'm not against using them. Pins, however, mean making single-use parts for a specific point in the rig. That may be where we go. I'm not opposed to it. 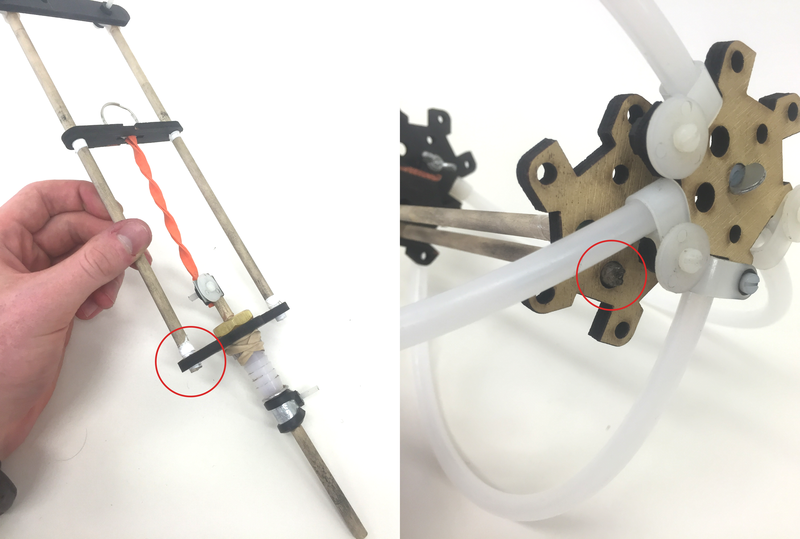 But ideally, we'd create a kit that is flexible and invites substantial modification of the existing parts as well as substitution with easy-to-find bits, like wood dowels. I believe a friction-fitting helps facilitate that interaction, and am therefore interested to thoroughly pursue it.